The song from Disney's 1994 animated film The Lion King was composed by Elton John with lyrics by Tim Rice. It was a UK hit, peaking at No. 14 and achieved even more success in the US, reaching No.4 on the Billboard Hot 100. The song was also a No. 1 hit in both Canada and France and it sold over 11 million copies worldwide. 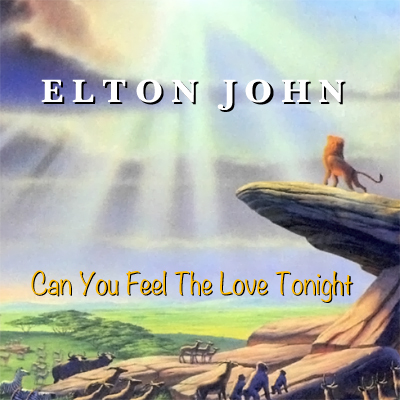 Elton John said of the song that "Can You Feel the Love Tonight" was meant to follow "Disney's tradition of great love songs", and that it could "express the lions' feelings for each other far better than dialogue could". It earned Elton a Grammy Award for Best Male Pop Vocal Performance.